The 'new' Smuggler Stealth 695, writes Gary Lovell, is a boat with history. Sporting a deep vee and fine entry, it's a boat that thrives in rough seas, pushing the waves aside with barely a pause in forward motion. It's a revival story, and a good one. Originally designed by David Mutimer in the 1970s as a family cruiser that could also be pressed into ocean rescue service or as a patrol boat for water police/customs, the original Smuggler 695 fitted its design brief pretty damn well. The moulds for the Smuggler boats have a pretty varied history, and no one has a truly accurate picture of their past. 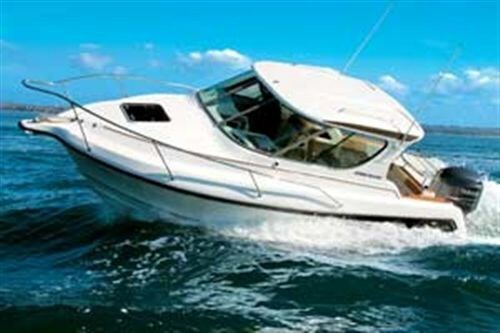 Following their introduction, the boats sold well up until the 1987 boat tax debacle, when one set of the moulds was taken to Australia and the other stayed in New Zealand. Although the boats did well in Australia up until a year ago when the business changed hands, around 26 were produced in New Zealand until Te Atatu boatbuilder David Pringle acquired them and set up Smuggler Marine Ltd. Pringle extended the hull, added the portofino stern, redesigned the deck and created to models: the Smuggler Stealth 695 hard top and an open boat version. The harbour was as flat as a table top with barely a breath of wind when we met the pair of Smugglers under the Auckland harbour bridge. We headed out to the Rangitoto channel for two reasons - there may just be a few more waves out there, and it was closer to the Noises where Pringle and a colleague wanted to go diving later on. So out we went with the Smugglers cruising along at 40 knots just off the photo boat's quarter - Trade A Boat's Sea Nymph. We were fortunate to time our run to coincide with an incoming ferry which provided the only waves we were to see that day. The Smugglers cleaved through the waves with barely a change of attitude - they continued flat and steady with only a couple of short, low blasts of spray being turned back down by the strakes and reverse chine above the deep vee of the hull's forward section. Both boats are powered by four-stroke Yamaha 225 outboard motors. 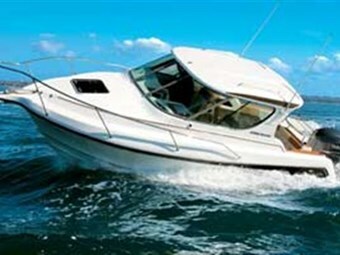 They push the Smuggler along at a top speed of 48 knots and a very comfortable 35 knots cruising. If you're in a hurry, the boat will take up to 300 hp on the stern. Once out passed the Ponui Passage light we gave up our unsuccessful wave chasing and put the boat through its paces on the flat water. Cruising at 40 knots the boat runs flat and true with very little wake or spray, and none of it coming up onto the windscreen. The noise from the hull was minimal even when we cut back across our own wake, and although the engine noise was slightly amplified by the enclosed nature of the hard top, it was in no way an intrusion. In tight turns at 30 knots the boat performed well with very little slip - perhaps unsurprising given the deep vee, solid strakes and reverse chine. 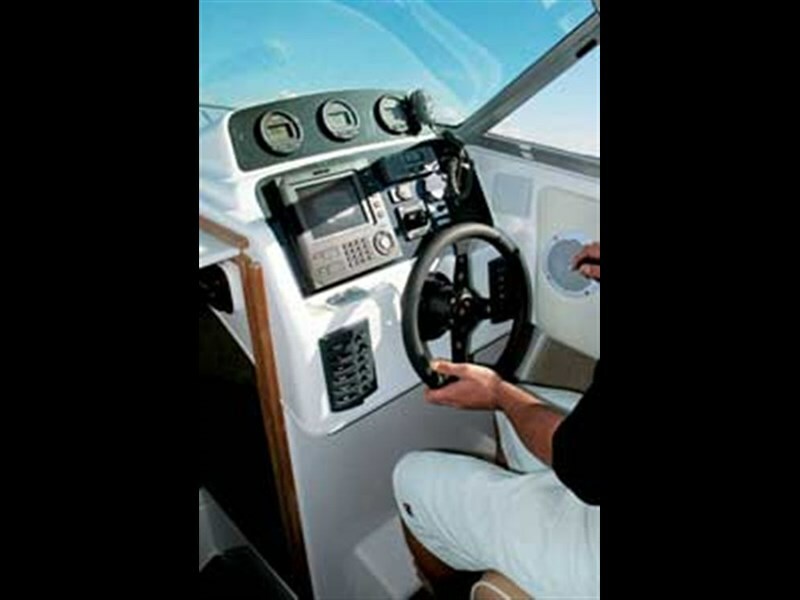 The hydraulic steering was smooth and light and the boat responded accurately to the helm's movements. Even cutting back in a tight turn through the boat's own wake, she didn't move around much and, with a comfortable lean into the turn, was perfectly under control. The Smuggler Stealth 695 is well laid out with seating for four on back-to-back helm and co-driver seats. Under each of these seats is a large storage area and gas struts make lifting and access easy. More storage for samller items such as wallets, cell phones and keys is provided in mesh pockets on the sides of the seats. Forward of the co-drivers seat is a covered locker containing a two-burner stove - ideally positioned for heating up the bake beans or water for the coffee. You could store supplies in any of the full-length shelves lining each side of the cockpit - though one side includes a rack for fishing rods. Carpet on the cockpit floor sports good anti slip underneath. The carpet is entirely removable so that "the boys" can rip into the fishing without too much concern about the mess if they get lucky and land a big one. The cockpit also has good washdown/shower facilities (fresh and saltwater), operating from the wash basin in the transom adjacent to the bait table. Lockers across the transom provide more storage space, as well as housing the deep cycle house battery and separate start battery. A hatch in the floor accommodates three or four dive tanks, while just forward of the hatch is the built-in, 300 litre fuel tank. The filler points is on the port side of the aft transom coamings. Two integrated boarding steps are adored with teak strips and provide good grip for if boarding from the water. Good-sized stainless steel hand grips fitted to the side flukes make the job much easier. Stepping into the cockpit is via a lift-out washboard at the port boarding step. All but the tallest passengers should be able to move around under the cockpit hardtop. It covers about half of the cockpit area. The remaining area of the cockpit can be fitted with a cover that extends from the pilothouse to the transom. A curved, toughened glass windscreen and sliding side windows give excellent all round vision and, as well as funnelling the breeze through the cockpit, allow the helmsman to communicate with someone on the foredeck or on the jetty without leaving the wheel. With vertical washboards and a sliding overhead hatch the cabin on the Stealth 695 is fully lockable. Inside, the cabin is fitted with the berth down eight side, with the option of a dropping in squab to accommodate a couple of cuddly people. There is plenty of storage on open shelves above each of the berths. It's a fairly spacious area, boasting a headroom of 1.54 metre and a large, opening forward hatch. There is also provision for carrying a portable toilet under the forepeak squab. Halogen lighting in the cabin - as well as under the hard top - make night time use of the boat a breeze. 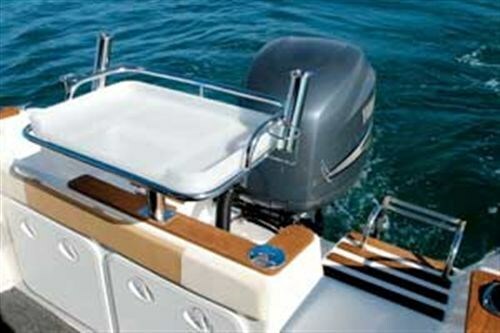 The narrow walk around deck gives access to the sharp end of the boat with good protection offered by the stainless steel bow rails. They're complemented by sturdy grab rails mounted on the pilot house. With the Simpson Lawrence Sprint 600 auto winch fitted to this boat, however, I suspect the anchor well will be accessed (should this ever be necessary) through the hatch in the cabin. The anchor well is deep and roomy, giving plenty of space to stow a serious amount of chain and warp. The anchor itself fits neatly into the bow roller with the shackle end hidden and secured under the forward edge of the anchor well hatch. A nice touch is the teak strip in the anchor channel, protecting the fibreglass from the chain and head of the anchor. Our review boat was finished in a tan and cream upholstery, with black carpet in the cockpit and blue squabs and a subtle tan design in the cabin. Very plush. 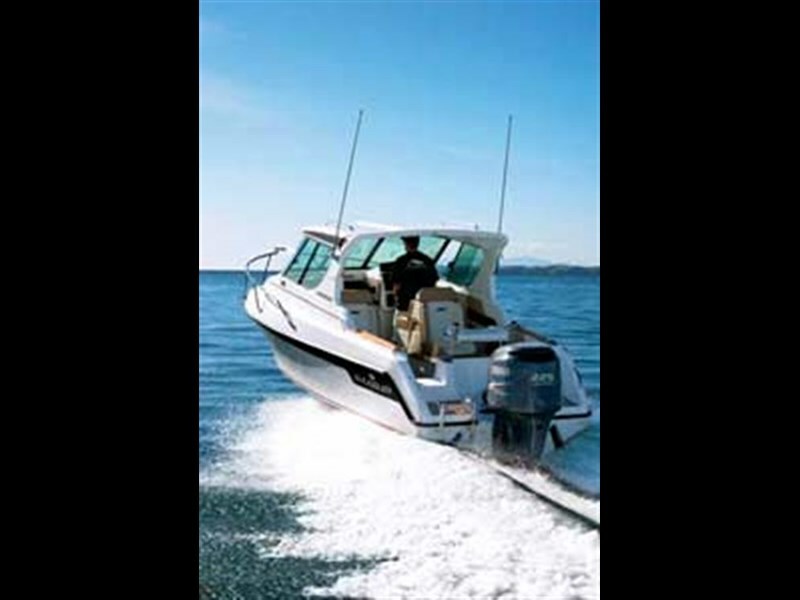 With the roomy cabin, galley stove, wash basin and Sanyo stereo system, it would prove a perfectly comfortable overnight boat for a couple of people. As we parted company with the two boats and headed back to the Orams Marine hardstack, I searched my brain for some kind of blemish on the Stealth 695 - I'm happy to report there was nothing I could fault. With six boats in the water and two more under construction, I'm sure the Smuggler legacy will thrive under the Pringle's stewardship.